Any chance for consensus among the big three fall literary fiction prizes in Canada was scuppered today with the announcement that Linda Spalding is the recipient of the 2012 Governor General’s Literary Award for English-language fiction. 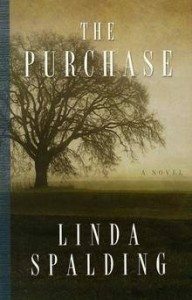 Spalding, who was also shortlisted for this year’s Rogers Writers’ Trust Fiction Prize, won for her novel The Purchase (McClelland & Stewart), about an exiled Quaker abolitionist who goes against his principles by acquiring a slave, leading to severe consequences for him and his family. Tamas Dobozy, who won the Rogers Writers’ Trust award last week for his linked story collection Siege 13 (Thomas Allen Publishers), was also on the GG shortlist. The other fiction nominees were Robert Hough for Dr. Brinkley’s Tower (House of Anansi Press), Vincent Lam for The Headmaster’s Wager (Doubleday Canada), and Carrie Snyder for The Juliet Stories (Anansi). Ross King won the English-language non-fiction award for Leonardo and the Last Supper (Bond Street Books). King, whose previous book on the Group of Seven won the 2010 Charles Taylor Prize, beat out a strong field of contenders that also included CBC foreign correspondent Nahlah Ayed for the memoir, A Thousand Farewells: A Reporter’s Journey from Refugee Camp to the Arab Spring (Viking Canada); Carol Bishop-Gwyn for the biography The Pursuit of Perfection: A Life of Celia Franca (Cormorant Books); Wade Davis for the historical adventure tale Into the Silence: The Great War, Mallory and the Conquest of Everest (Knopf Canada); and Noah Richler for the polemic What We Talk About When We Talk About War (Goose Lane Editions). Julie Bruck won the English-language poetry award for her third collection, Monkey Ranch (Brick Books), and Catherine Banks took the English-language drama award for It Is Solved by Walking (Playwrights Canada Press). On the children’s side, the award for English-language text went to Susin Nielsen for her young adult novel The Reluctant Journal of Henry K. Larson (Tundra Books). Isabelle Arsenault took the illustration prize for Virginia Wolf, with text by Kyo Maclear (Kids Can Press). Winners in each category receive $25,000, with the publisher of each winning book receiving $3,000 in promotional funding. Each of the runners-up receives $1,000. Full lists of winners in both English and French are available on the Canada Council website.